He was caught red-handed with the money in his bag. The theatre has been left to stand/lie derelict. The developers refurbished the house inside and out. He is wearing a high-vis jacket but he isn’t attracting much attention. And that’s just the way he likes it. 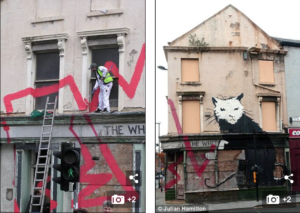 For this never-before-seen picture shows elusive street artist Banksy at work on one of his most famous pieces – a giant white rat daubed on to Liverpool’s derelict White Horse pub. 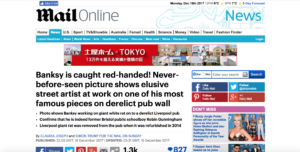 It is the first photograph to identify Banksy at work, and it categorically confirms that he is indeed former Bristol public schoolboy Robin Gunningham, first unmasked by The Mail on Sunday in 2008. He waved to attract the attention of the waitress. The trial has attracted international attention. I knocked on the window to get her attention. He categorically denies the charges. He categorically refused to take part in the project. Since our revelation, rival theories have continued to abound. Some claim that Robert Del Naja, of Bristol pop group Massive Attack, is the real Banksy, and last week a picture taken in Tel Aviv led to renewed speculation. It turned out to be a photo of a 45-year-old Anglo-Israeli graffiti artist called James Ame. But a new book called Stealing Banksy? has concluded that The Mail on Sunday was right all along. It is written by Tony Baxter of the Sincura Group, which has rescued and restored several Banksy murals, and it includes the picture of the artist painting his White Rat in 2004. It was taken by photographer Christopher Wilson, who said: ‘I knew Liverpool was going to be regenerated so I thought it would be a good idea to make a record of the decayed buildings beforehand. So, I wandered around the town centre, taking photographs. Renewed efforts have finally led to an agreement. Graham returned to the sport with renewed vigour after injury problems. Do you think he’s been cheating us all along? Do you think he’s been lying to us all along? I knew all along that it wasn’t his real name. The money will be used to regenerate the town centre. As president of the college, he regenerated a failing institution. I knew she was coming that afternoon because she had phoned beforehand to say so. My sister likes wandering around the city at night. The Mail on Sunday’s 2008 scoop came after a year-long investigation in which we spoke to dozens of people associated with Gunningham, a former Bristol Cathedral School pupil now married to former Labour researcher Joy Millward. Last year, geographic profiling, more often used to catch criminals or track the spread of disease, found Gunningham was ‘the only serious suspect’. Today, Banksy is said to be worth about £20 million. The Liverpool giant rat was removed from the pub when it was refurbished in 2014. Earlier this year it was sold with four other Banksy pieces removed from walls in Liverpool for a reported £3.9 million to an anonymous Qatari buyer. Stealing Banksy? is available for £15.99 from stealingbanksy.com. The course is a standard year-long introduction to Western civilization. I don’t think I could look after children all day long. The company has issued a strong denial of responsibility for the mistake. The CEO issued a denial of the report that she is about to resign. His statement is not a denial. My mum always comments on what I’m wearing. I’m not in a position to comment on the matter. I’d just like to comment on what your previous caller was saying. He commented that the two essays were rather similar. Researchers who read the report commented that it had many errors.